When it comes to Too Faced, I say time and time again how much I love their brand. One of my all time favourites, their eyeshadow palettes especially, blow me away. I have the biggest collection of Too Faced eyeshadow palettes – in fact, I have more of theirs than anyone else. Shows how much of a fan I am! But when it came to the Chocolate Gold palette, I knew I’d be on to another winner. I should start by saying that it’s all Erin’s fault. 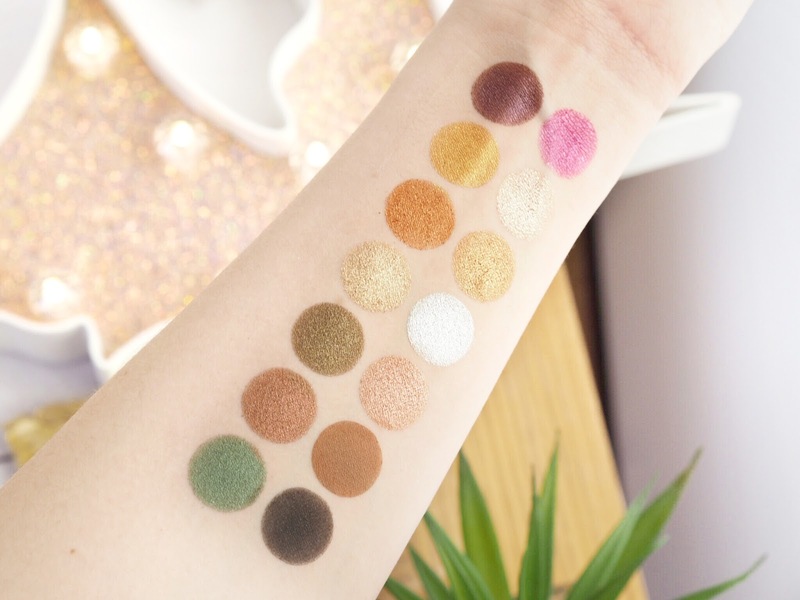 She did an amazing blog post where she swatched the palette and that was it – I was sold on it. I don’t blame her though, I thank her because I haven’t put this palette down since it arrived. 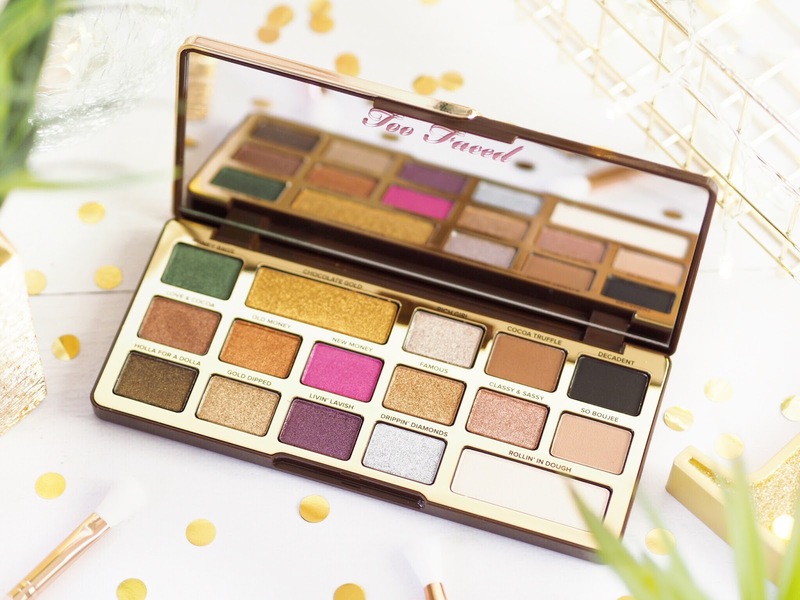 I’m all about the glitter and shimmery eyeshadows, they’re my favourite type of finish and one thing I love about Too Faced palettes is how they always have something cool and unique about them. This one is no different. With this one it’s the fact that it combines two of my favourite things – chocolate and gold. A girl can never have too much of either, right? But this palette is infused with actual gold within the formula to make those shimmers and glitters really pop on an extraordinary level. 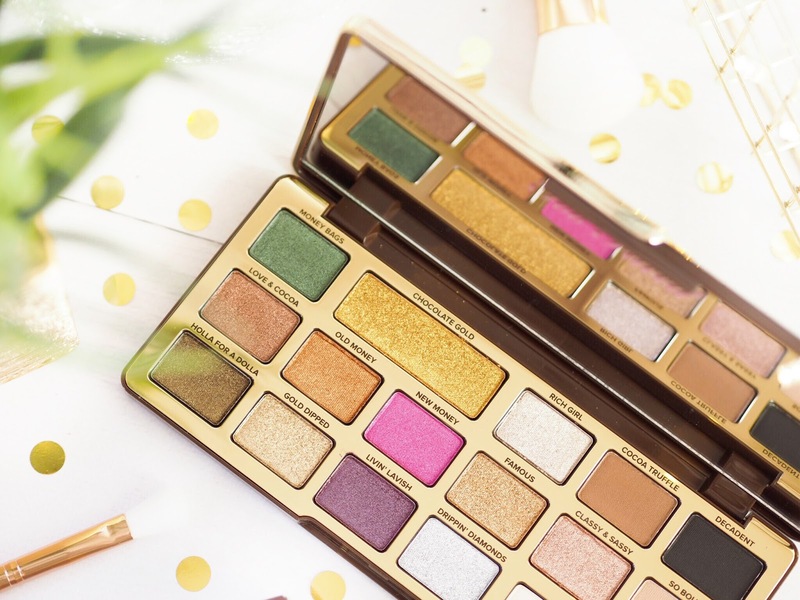 Eyeshadow infused with gold is not something I’ve come across before and the novelty wasn’t lost on me. Nothing says ‘luxury’ more than being able to say you’ve got actual gold on your eyelids, right? 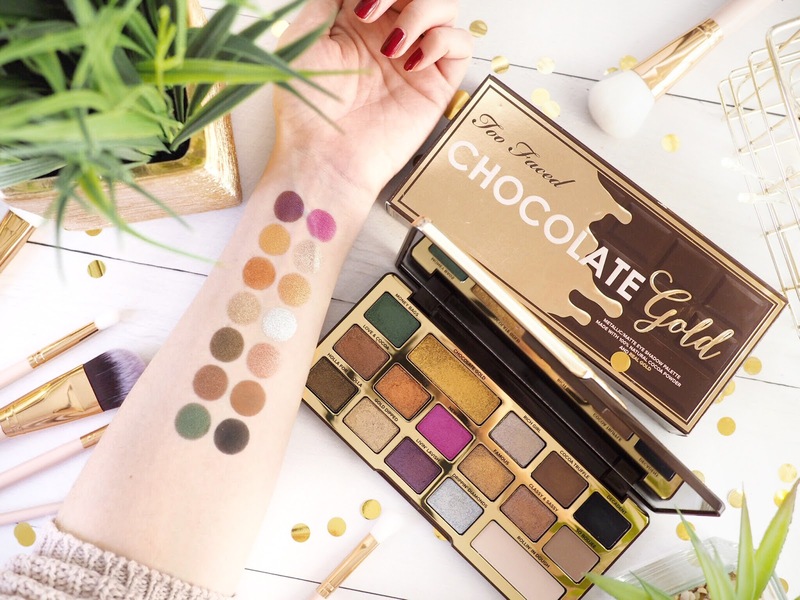 The other great thing about it, is that like all the other chocolate products in their range, The Chocolate Gold palette is scented and infused with cocoa powder too – so it smells as yummy as chocolate every time you use it. And the formula is soft and gentle because of it too. The palette features a couple of matte shades for your crease and transition, but after those the majority are shimmery as heck – and I love it, I love it a lot. Foil effect shadows are BIG right now so this palette is one for anyone who loves that dimension to their make-up. (Like me!) The colour payoff on them all is seriously impressive too, making it a good quality palette for your collection. The colours just pop with a single swipe. Plus they blend like butter on the eyes, the creamy texture that produces the high payoff means they blend really well either alone or with each other and it’s one of the few palettes I’ve found where you don’t need a primer. Because the colours pop on their own and stick well without one. Which I always like to know and shows a good quality eyeshadow. So, let’s take a look at the colours, as if you didn’t know already that you want it! So if the scent, the quality and the cuteness didn’t get you, then I’m sure the swatches will have. 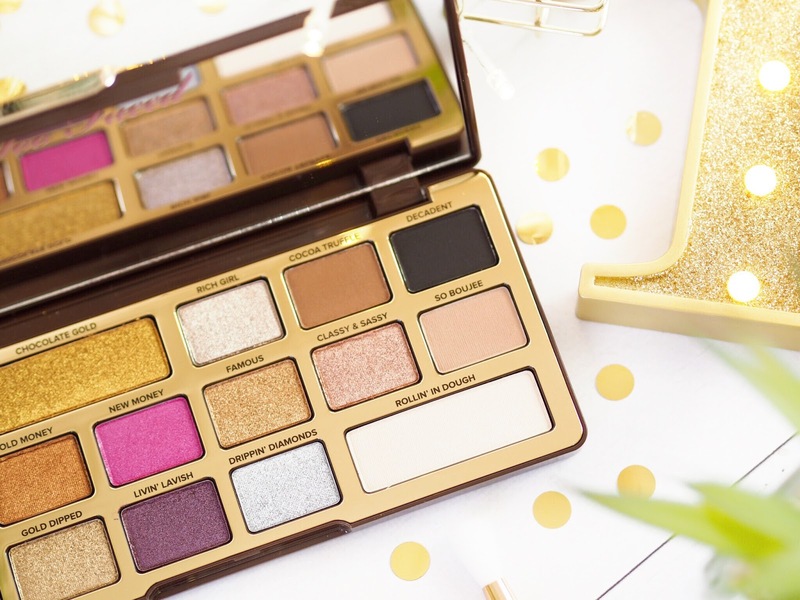 Because girls, you NEED this palette in your life. Plus for £39, it works out at £2.40 per shadow, it would be rude not to right? 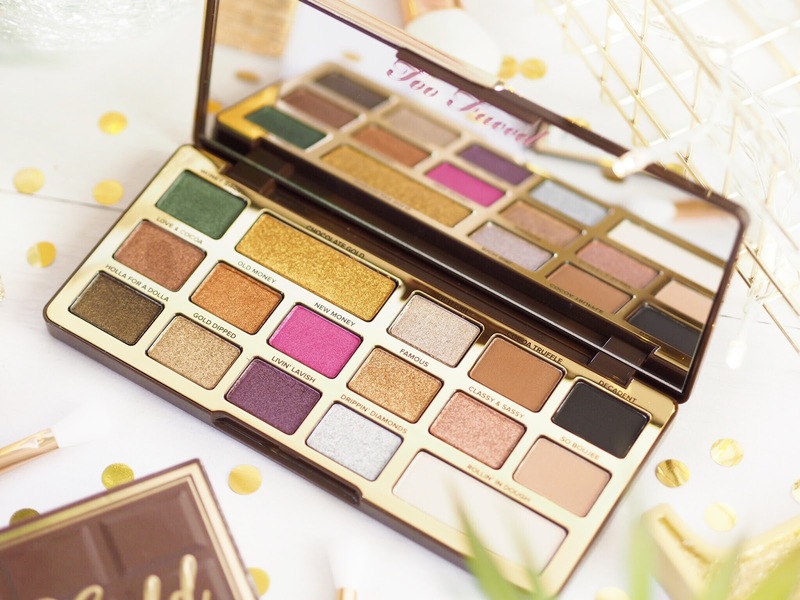 Get the Too Faced Chocolate Gold Palette here. Previous Post Are WE The Actual Problem With Instagram?